Another day another smoothie. I’m sorry guys, but I can’t help myself. I’m in the mood for smoothies so that’s what you’re getting. I’ve made this raspberry-grapefruit smoothie several times and it’s delicious. Fresh, healthy, and well, grapefruit-y. It’s so good, I had to share it with you. I love pink grapefruit. It’s one of my favorite fruits. I like to peel it like an orange and remove all the skin to get the flesh. It’s a lot of work, but that’s the way I like to eat it. I’m weird, just like that. Pink grapefruit is bitter, tart, and sweet at the same time. Every time you bite into it, it’s an explosion of taste. It’s nothing short of flavorsome. It’s also a nutrient-dense food. It’s crammed with Vitamin C, Vitamin A, fiber, calcium, and the cancer-preventing antioxidant called lycopene. It’s also great for detox as it’s packed with water. Studies have shown that eating one grapefruit a day may even help lowering cholesterol. 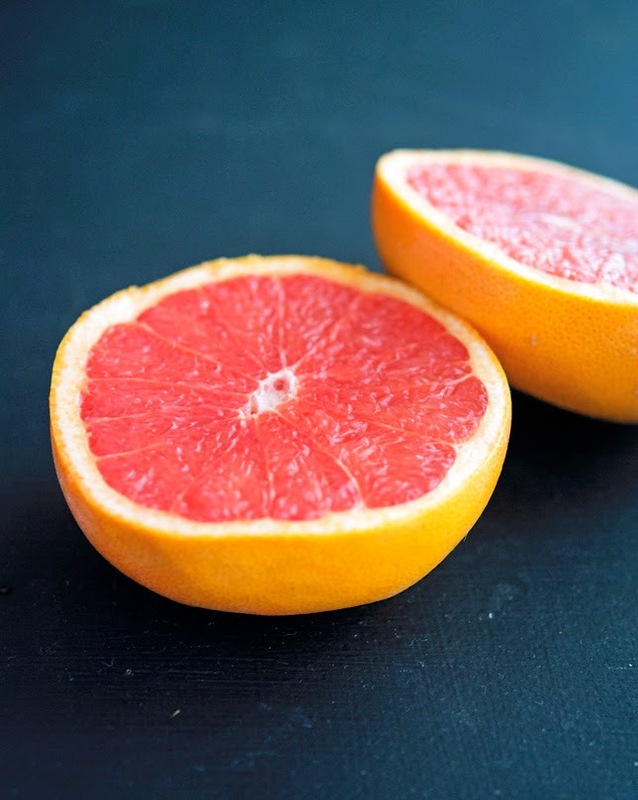 Actually, grapefruit is so powerful in the body that those on certain medications cannot eat grapefruit. So be careful with that. 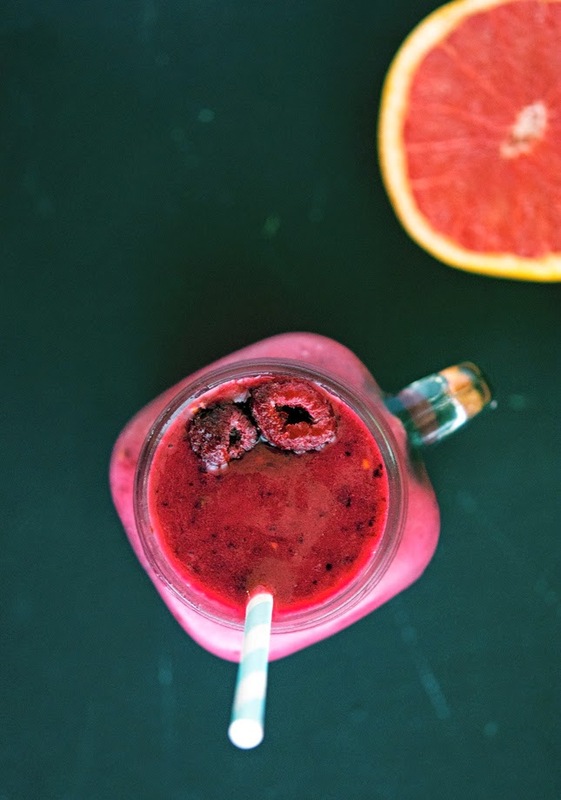 In this smoothie, pink grapefruit blends perfectly with raspberries. They complement each other so well, I can’t tell you enough about it. Banana makes the best base fruit as it thickens the smoothie, using only raspberries and grapefruit juice would make for a thin drink. It also helps against the tartness and bitterness of the grapefruit, which I personally don’t mind, but some people find the natural taste a bit too bitter. This smoothie is premium liquid fuel, a refreshing and healthy way to start your day! Raspberry-Grapefruit Smoothie Print this recipe! One serving yields 245 calories, 1 gram of fat, 60 grams of carbs, and 3 grams of protein. THE COLOR OF THIS SMOOTHIE! It makes me eyes happy. And the whole "super good for me" thang makes my body happy. This is fab Mike! Pinned! I love grapefruit too, and eat it the same way- orange style. It is my favorite part of winter! I love that this smoothie has three simple ingredients. Thanks for sharing!! Pinning this, fo' sho. This sound delicious, I think I'll add a bunch of spinach just to have my veggie portion of the morning! Hi Mike! Today I added the spinach to the smoothie, happy to report that it did not change the taste at all. I love grapefruit too and don't mind the manual labor before eating it. I have all the ingredients of this smoothie at home, it might just be breakfast tomorrow! 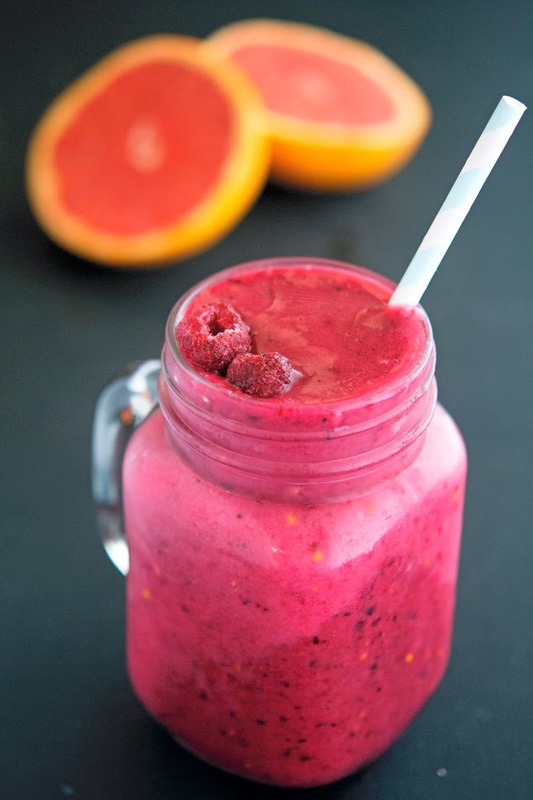 This is indeed a gorgeous smoothie - that color is awe-inspiring! You are a strange individual Shashi, I'm sorry to say it but you truly are. You like beets and don't like grapefruit...how's that even possible? This sounds wonderful, especially since I'm now off the medication that conflicted with grapefruit. I'm wondering if it's necessary to juice the grapefruit of if you could just cut it up and blend it with the other ingredients. (I just did one with oranges where I left the segments intact, and it worked nicely.) I'll definitely have to invest in some frozen raspberries. Personally I prefer to juice the grapefruit before as I don't like the bits of grapefruit skin in my smoothie. If you're not bothered by them, I say go with it! Made this for breakfast today and it was wonderful. Even my husband was enthusiastic about it - it has to be really good to get that positive a reaction from him. We really like the bright flavor. My solution to the skins was to cut the grapefruit in half, section it with a grapefruit knife, and then squeeze the rest of the juice out. It worked well and avoided the skin problem. (I did have a little bit of a problem with seeds - it's been so long since I've eaten grapefruit I'd forgotten it has seeds…) This recipe is definitely a keeper! Mate, keep the smoothies coming- I'm just chilling here in my singlet and shorts because it's a bloody oven. I'm watching the Australian Open every night and all the players are complaining about the heat. Is it really that hot down there? Or are they just being a bunch of wussies? Hi Mike, we have a pink grapefruit tree in our front yard and have them coming out of our ears, love this smoothie! I just so happen to have all of these ingredients. A new farmer's market opened in my area and the fresh produce was much cheaper than the regular grocery stores, so we stocked up. Can't wait to try this! Looks so delicious, Mike! I have got to try this! I recently had a smoothie blender for Christmas which I have brought to University with me and I've been using it non-stop! I love grapefruit! This smoothie looks so good, Mike! I would love to try! I need this in my life. Our breakfast these days is a good smoothie, and this is a fab idea. Gonna try it. And don't be sorry, we love these healthy yum ideas. I love grapefruit! Plus the color of this smoothie, this would be nice. I can't imagine myself having this PINK smoothie with Mott 32's (http://mott32.com/) PINK chocolate mousse.. Waaah So much with color pink, I'll be the happiest if I have them on Valentines. Can I tag my husband here.. Hahah.. Anyways, Thanks for the share. This is AWESOME! I finally got my act together and made this - I'm drinking it right now for breakfast and it's awesome! There's something addictively refreshing about it - definitely having it again tomorrow! 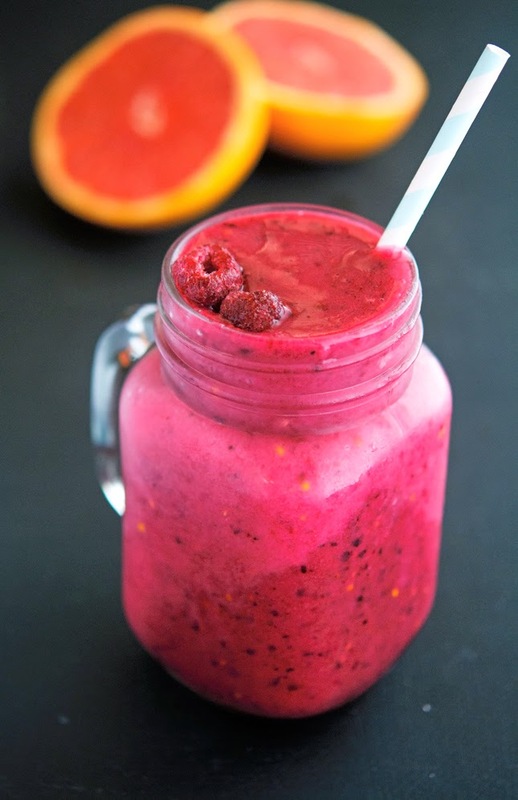 This looks like a great smoothie! Although I would like to know what other foods I can take with the smoothie. What else would go great with this if I were to have it with something else? Real nice mix. Loved it. And I really like the way you have presented it. Very cool.